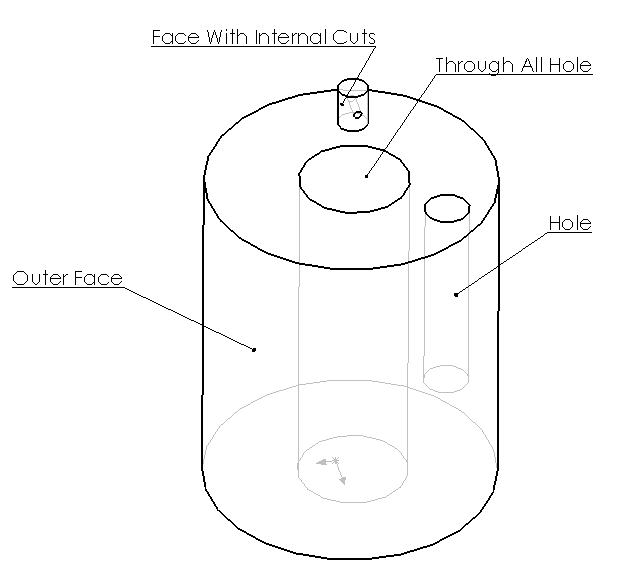 This macro identifies the type of the selected simple cylindrical face (through all hole, blind hole or external hole) based on the loops type using SOLIDWORKS API. Macro will only work with cylindrical faces whose adjacent faces are planar faces and upper and lower boundaries of the cylinder are closed circular edges. Macro traverses the loops of coedges of upper and lower boundary edges. If there is at least one internal loop that means that selected face is a hole, otherwise it is an external boss. If both of the boundary loops are internal that means that the hole is through all, if one boundary loop is external but other is internal that means that the selected face is a blind hole (i.e. not a through all hole). MsgBox "Selected face is a blind hole"
MsgBox "Selected face is an outer face"
MsgBox "Selected face is through all hole"
MsgBox "Selected face contains cutouts"
MsgBox "Selected face is not cylindrical"